Taos (Don Fernando de Taos), established between 1780 and 1800, is one of the oldest European settlements in the Taos valley (a key area of northern New Mexico), and consists of a central plaza and surrounding residential areas. Originally constructed as a Spanish fortified plaza ringed by low adobe buildings, the town grew beyond its original defensive walls and became an important center for trade on the Santa Fe Trail. 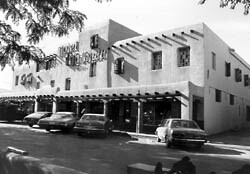 Taos continued to expand in the late 19th century when artists settled in and around the plaza. This led to a cultural revival for which Taos is still well known. Today, aspects of each of its periods of history are evident in the Downtown Historic District, where Spanish Colonial Style residences stand side by side with Territorial, Mission Revival and Pueblo Revival style houses. Taos Downtown Historic District is roughly bounded by Ojitos, Quesnel, Martyer's, La Placacitas and Ranchitos sts. in Taos, New Mexico. For more information visit the Taos Chamber of Commerce website.